U.S. Rushes Aid To Haiti, Where Hurricane Matthew Killed Hundreds : The Two-Way USAID is airlifting supplies that could help up to 100,000 people, including 40,000 blankets, 20,000 hygiene kits, and nearly 18,700 kitchen sets. 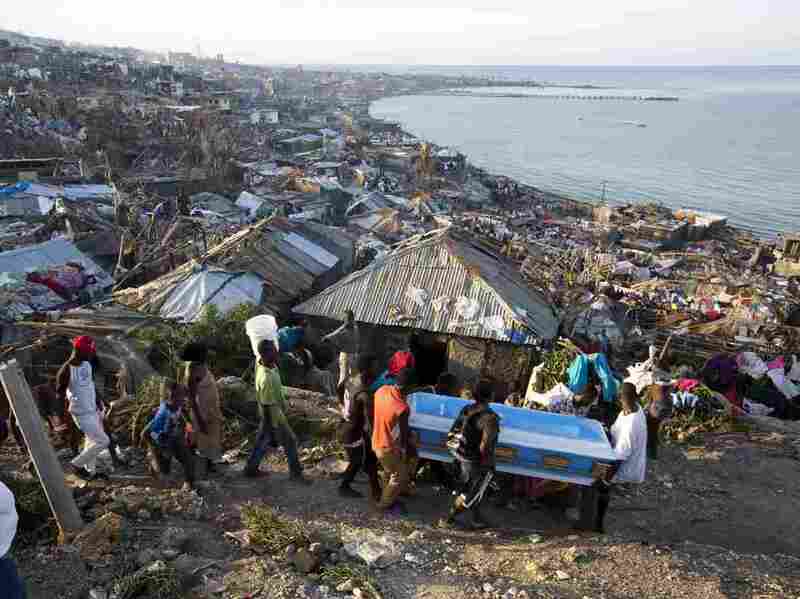 Residents carry a coffin containing the remains of a pregnant woman killed by Hurricane Matthew, in Jeremie, Haiti. People across southwest Haiti are salvaging what they can from wreckage the Category 4 storm caused. As fears are confirmed about the extent of the damage Hurricane Matthew inflicted on Haiti — with a government agency saying 470 people died in one district alone — USAID is airlifting more than 480 metric tons of relief supplies to the small nation. An official in Haiti's Civil Protection Agency tells the AP that in addition to the 470 deaths he's confirmed in one district, "The death toll is sure to go up." The U.S. aid agency says it's sending supplies that could help up to 100,000 people, including 40,000 blankets, 20,000 hygiene kits, and nearly 18,700 kitchen sets. Some of the aid will be delivered by the U.S. Navy. "Tens of thousands of people remain in shelters after the storm. The USAID shipments includes rolls of plastic sheeting to help people temporarily replace roofs that were ripped away by the Category 4 hurricane. "The U.S. Navy amphibious transport ship Mesa Verde is also expected to arrive off the coast with 700 sailors and Marines aboard. The Navy plans to use helicopters and landing craft to ferry relief supplies ashore." The U.S. Department of Defense's role in the aid effort comes after Hurricane Matthew crippled access to southwest Haiti and other hard-hit areas, washing out bridges and roads. The immediate need for food and shelter could mushroom into other needs in the near future. As Jason reported yesterday, "Hundreds of thousands of people had their homes partially or totally destroyed. Crops have been wiped out." And as NPR's Rebecca Hersher reported for the Two-Way this week, "Amidst the flooding, the specter of a spike in cholera cases has aid organizations worried that the physical destruction of buildings could be just the beginning of Matthew's deadly effects in Haiti." Rebecca also noted that Hurricane Matthew has forced another delay in Haiti's already-delayed presidential election.